If you have a spider infestation in the Frisco area – contact Integra! 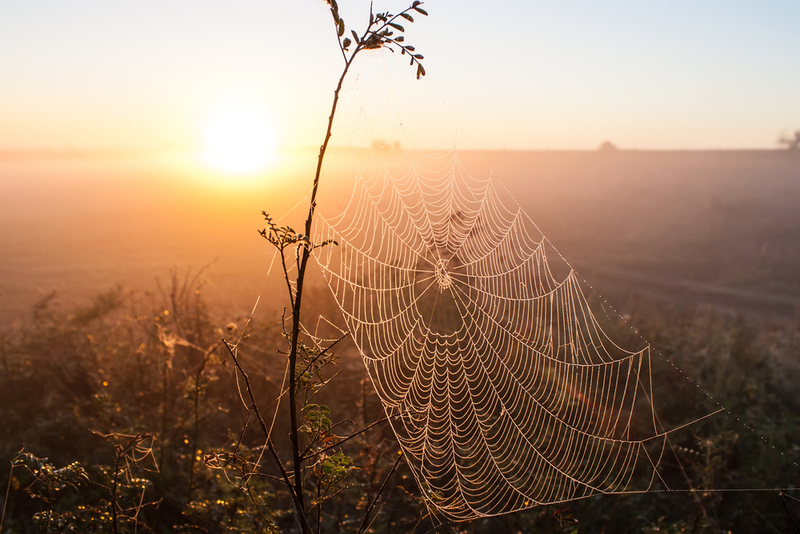 With over 23 years experience with spider control in Frisco, our team of highly trained, certified technicians will eliminate any type of spiders quickly, and safely. Most spiders are small, inconspicuous arthropods which are harmless to humans. Their beneficial role in keeping insect populations in check far outweighs the hazard posed by the few spiders that occasionally bite humans. Very few of the nearly 900 species of spiders in Texas can hurt people. Only two groups – recluse spiders and widow spiders – are considered poisonous to humans. Tarantulas, jumping spiders, wolf spiders and some other spiders worry people who mistakenly believe they are seriously poisonous. Although these spiders are often large, hairy and formidable-looking, their bite is typically less harmful than a bee sting. People who are extremely allergic to spider venom, though, react severely to any spider bite. Many people have a phobia of spiders. However, knowing how to distinguish harmless from dangerous spiders, how to prevent them from entering the home and how to control those that do enter can prevent needless concern and reduce the chances of harm to humans. As their name implies, recluse spiders are generally shy. They spin nondescript white or grayish webs, where they may hide during the day. They are predators of insects and other arthropods, known to wander around houses looking for prey. While walking, their body and legs together cover an area about the size of a quarter or half-dollar, but the body itself is only 1/4 to 1/2 inch long. Their color varies from orange-yellow to dark brown. The brown recluse’s most distinguishing characteristics are its eye pattern and markings on the back. Recluse spiders have six eyes arranged in three pairs in a semicircle on the forepart of the head. Uncommon in spiders, this eye pattern helps separate recluse spiders from similar species. The eyes also form the base of a violin-shaped marking on the back. The neck of the “violin” forms a distinct, short median groove. The violin marking may be conspicuous or blend with the background color. 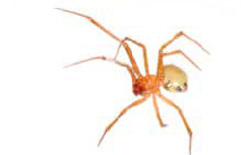 One other group of spiders, the spitting spiders, Scytodes, has a similar eye arrangement. A spitting spider has long, spindly, banded legs and a spotted pattern on its cephalothorax, the front body region. The cephalothorax is raised in spitting spiders but nearly flat in recluse spiders. Slow-moving, spitting spiders are common in window sills and considered harmless. Brown recluse spiders lay one to two egg masses per year in dark, sheltered areas. Similar to those of many other spiders, recluse egg cases are round, about 5/8 inch (1.6 cm) in diameter, flat on the bottom and convex on top. After 24 to 36 days, an average of 50 spiderlings emerge from the egg case. Their slow development is influenced greatly by nutrition and environmental conditions. The effects of a recluse spider bite may be immediate or delayed, depending on the amount of venom injected and the victim’s sensitivity. Sometimes hardly noticed at first, the bite later causes a stinging sensation that may include intense pain. Fever, chills, nausea, weakness, restlessness and/or joint pain occur within 24 to 36 hours. The bite also produces a small blister surrounded by a large congested and swollen area. The venom usually kills the affected tissue, which gradually sloughs away and exposes underlying tissues. The edges around the wound thicken, while the exposed center fills with dense scar tissue. Healing may take six to eight weeks, often leaving a scar, depending on the amount of venom injected and the reaction of the individual. 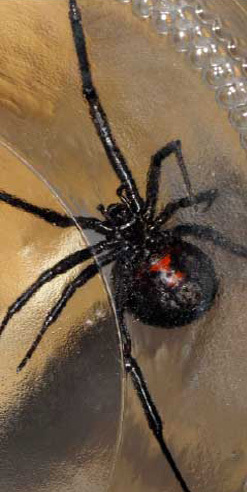 The southern black widow, Latrodectus mactans, and its relatives live across the entire United States. Other widow species found in Texas are the western black widow, L. hesperus; the northern black widow, L. variolus; and probably the brown widow, L. geometricus. Their coloration varies considerably. For proper identification, an expert may be needed to examine mature specimens. Widow spiders are found in protected cavities outdoors. Around houses, they may live in privies, garages, cellars, furniture, shrubbery, ventilators, rain spouts, gas and electric meters and other undisturbed places. Widow spiders also may be seen in cotton fields and occasionally vegetable gardens. Like most spiders, widow spiders are shy and retiring. People are bitten occasionally when they accidentally disturb a hidden spider or its web. To avoid hidden spiders, take care when putting on seldom-worn shoes or clothing. Widow spiders are typically jet black, but their color can vary considerably. Males and juveniles tend to show more color, with orange, red and white markings on the back and sides. On the underside of their rounded abdomen are two reddish triangles that may be united to form an hourglass shape. Some individuals have irregular or spot-like markings; others have none at all. Adult widow spiders average 11/2 inches long and have eight eyes in two rows, a common spider pattern. Females lay eggs in a loosely woven cup of silk. The 1/2-inch-long oval egg sacs hold from 25 to 900 or more eggs, which incubate for about 20 days, depending on temperature and time of year. Spiderlings usually stay near the egg sac for a few days after they emerge, when cannibalism is prevalent. Surviving spiderlings disperse by “ballooning.” They spin a single silk thread which is caught by the wind, which carries them to a new location. When about one-third grown, they establish themselves in a protected place and build loosely woven webs. The spiders usually remain in their rather coarse, irregular, tangled webs for the rest of their lives. Over time they extend their webs and capture progressively larger prey. Males eventually leave their webs to find females for mating. Contrary to popular belief, most females do not normally eat the males after mating. This habit, found in a few species of widow spiders from other areas, gives the group its name. If noticed at all, a widow spider bite may feel like a pin prick. Usually the bite location is indicated by a slight local swelling and two red spots surrounded by redness. The reaction is systemic and pain becomes intense in one to three hours, continuing for up to 48 hours. Symptoms include tremors, nausea, vomiting, leg cramps, abdominal pain, profuse perspiration, loss of muscle tone and rise in blood pressure. The toxin can also cause breathing difficulties and sometimes unconsciousness. However, less than 5% of people bitten by widow spiders die. Tarantulas in Texas are members of the hairy mygalomorph family in the genus Aphonopelma. 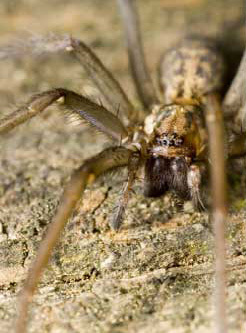 These large, hairy spiders are brown to black and more than 3 inches long when full-grown. Females, larger than males, have abdomens about the size of a quarter. Tarantulas hunt at night and spend the day under rocks, in abandoned mouse burrows or in other sheltered areas. They may be seen in the evening or late at night along country roads or trails. Migrating male tarantulas can be commonly seen for a few weeks in early summer. This migration’s purpose is not completely understood, but it may occur as males seek mates. Tarantulas are sometimes kept as pets and can become quite tame. Although they can be handled, be careful, because they can quickly become disturbed and pierce the skin with their fangs on the chelicerae. 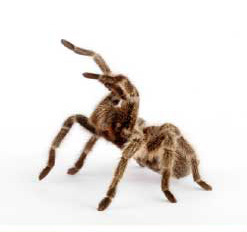 The hair on some tarantulas may irritate the skin, so take care when handling them. Tarantulas need a constant supply of water in a flat dish into which they can lower their mouths. They eat live crickets, mealworms, caterpillars or other insects and can go for several weeks without food, sometimes refusing to eat before molting. Tarantulas can crawl up glass and escape through small openings, so they must be kept in a container with a good lid. Jumping spiders, all of which are in the family Salticidae, are among the most interesting spider groups to watch. Jumping spiders come in many sizes and color patterns. Active hunters during the day, they have good eyesight, relying primarily on movement to locate prey. They stalk their prey before attacking in a fast leap. Jumping spiders put out a line of webbing when they jump and can sometimes be seen dangling from this silken dragline after a leap that fails. Many jumping spiders are bold, stocky and often brightly colored. They often have conspicuous bands of black and white on their bodies or legs. Others have velvety red abdomens and some even have metallic colors on the chelicerae. 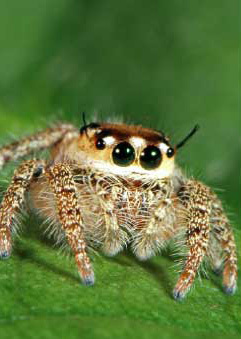 Jumping spiders have eight eyes, with one large pair in the front. Like most spiders, jumping spiders are not considered hazardous to humans and are unlikely to bite unless cornered or handled. The bold jumper, Phidippus audax, is one of the most common and conspicuous of the jumping spiders. It is black with a distinct irregular orange to white spot on the back of the abdomen. It can be found in gardens and around homes. Wolf spiders hunt at night. Usually brown and black, they may have longitudinal stripes. Wolf spiders are large and often seen under lights. They can be seen at night when their eyes reflect light from a flashlight, headlamp or car headlight. Members of the genera Rabidosa and Hogna are some of the most conspicuous wolf spiders. They form webbing only to provide daytime shelter, not to capture prey. Many wolf spider females carry their egg masses below their abdomens until after the eggs hatch. Young spiderlings cling to the mother’s abdomen for a short time after hatching. Wolf spiders frequently enter homes and backyards but pose no danger to people”.